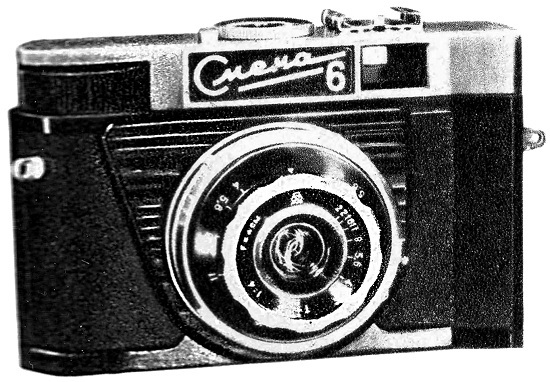 Camera identical to Smena-5 with synchronized flash and selftimer. 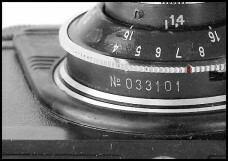 Lens coated „T-43“, additional shutter speed 1/15. No more strap lugs. 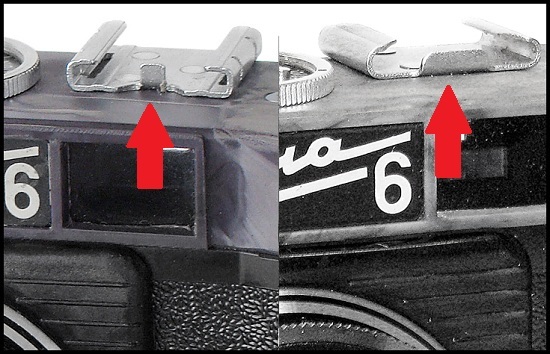 On early models body still can see the signs of strap lugs. In the back of camera imprinted either old GOMZ logo, either blank circle. Original price (in year 1961) 13,5 roubles. PK2405. 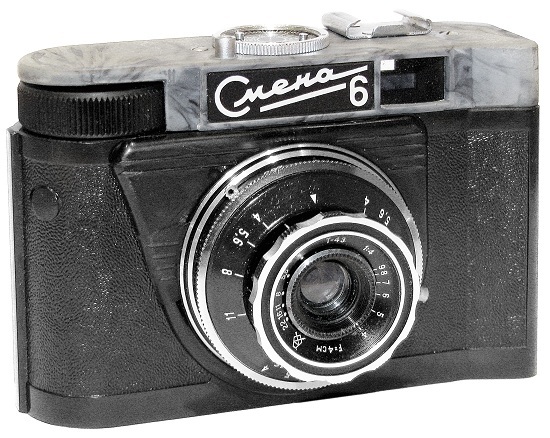 The prototype Smena-6 model with originally designed black body and dark grey top. Decorative shutter frontplate as on prototype Smena-7 camera, GOMZ logo (biger size) on the frontplate of the lens. 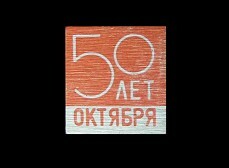 Nameplate in Cyrillic characters. Prototype Smena-6 comes with strap lugs! The sample opposite was found on the introduction article in Soviet Photo magazine No. 6' 1961. PK2405 - Smena-6 prototype camera. PK2410. 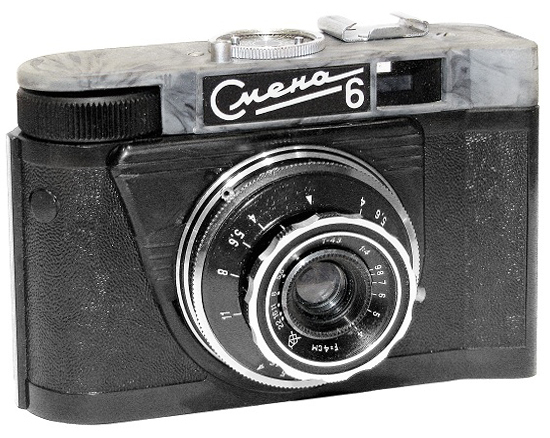 This unique and very early camera has very similar design to prototype sample. Black body with violet colour speckled top plate, decorative shutter frontplate, GOMZ logo (big size) on the lens frontplate. Shutter speed 1/125s not marked at all. No decorative rim at the body margins! 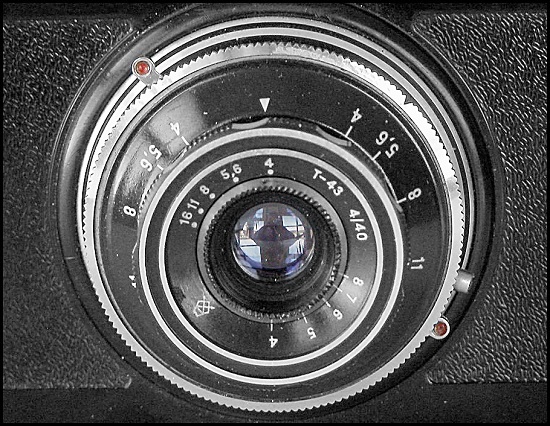 Aperture numbers from f/4 to f/22(!). Tripod thread - 3/8''. PK2415. Camera identical to PK2410, but with different, more common top plate already. Slightly changed design of an accessory shoe. Still big GOMZ logotype. 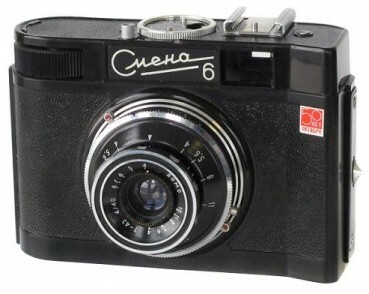 Camera #009569 opposite from private collection in Russia. PK2420. Camera identical to PK2415, but with small GOMZ logotype on lens already (from appr. 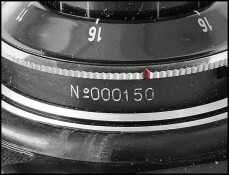 s/n #010.000). No otherwise different. PK2425. This very unique and rare to find version is identical to PK2410, but with "metal like" imitation on the top plate. Still big GOMZ logo on the lens. 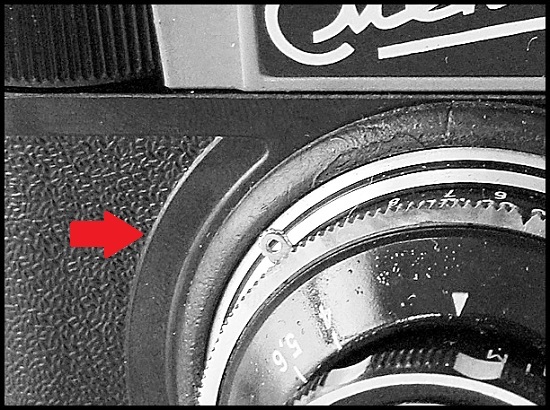 Shutter speed 1/125s not marked at all. No decorative rim at the body margins! 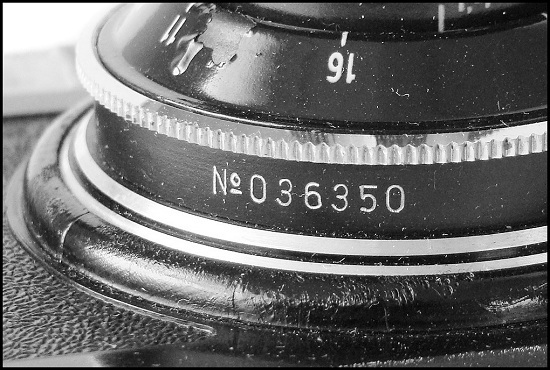 Aperture numbers from f/4 to f/22. Tripod thread - 3/8''. PK2430. 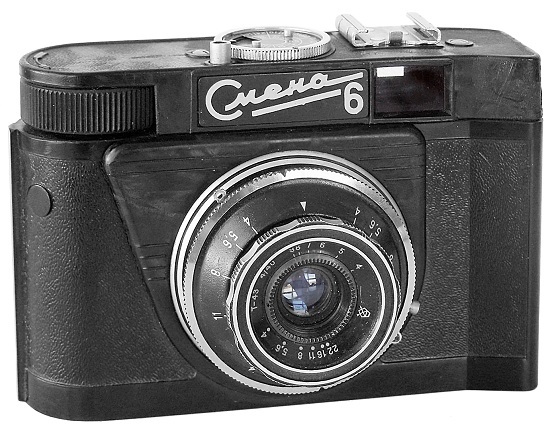 The sample of an early version again. 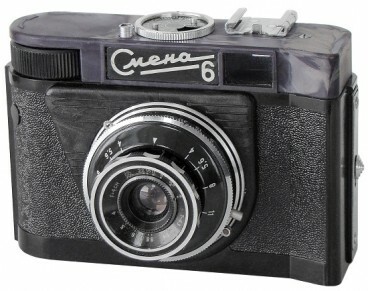 Black body with usual grey top plate, decorative shutter frontplate, GOMZ logo is smaller size already. Shutter speed 1/125s not marked at all. No decorative rim at the body margins! 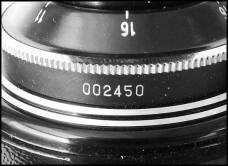 Aperture numbers from f/4 to f/22. Tripod thread - 3/8''. PK2435. Seems to be the latest version of an early Smena-6 camera. Totally black body with decorative rim at the top plate markings already. 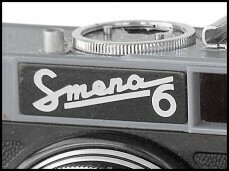 Small GOMZ logo on the lens frontplate. Shutter speed 1/125s not marked at all. 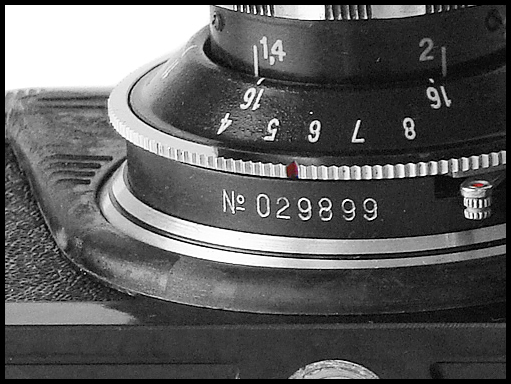 Aperture numbers from f/4 to f/22. Tripod thread - 3/8''. Some regular (PK2450) Smena-6 cameras can be found with lower s/n. 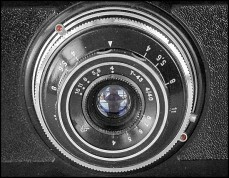 Camera #033101 from Juhani Halmeenmaki (Finland) collection. PK2445. Camera identical to early type cameras, but with regular shutter view already. The top plate is painted in "metal-like" imitation (!) No decorative rim at the body margins yet. Shutter speed 1/125s not marked at all. 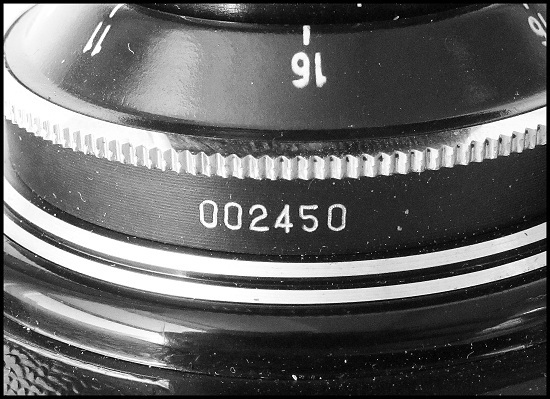 Aperture numbers from f/4 to f/22. Tripod thread - 3/8''. Very rare to find nowadays. PK2450. 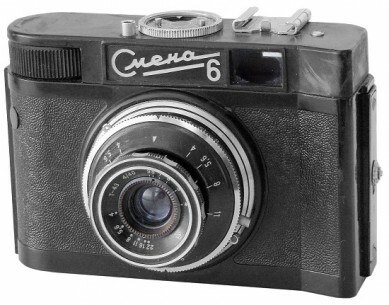 Camera identical to early type cameras, but with regular shutter view already. Totally black body. No decorative rim at the body margins yet! 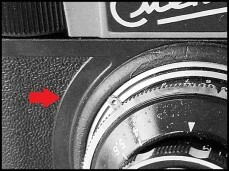 Shutter speed 1/125s not marked at all. 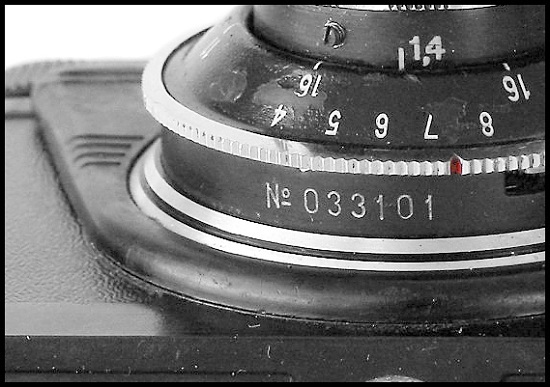 Aperture numbers from f/4 to f/22. Tripod thread - 3/8''. Very rare to find nowadays. PK2453. Camera identical to PK2435 (see above), but with regular shutter design already. 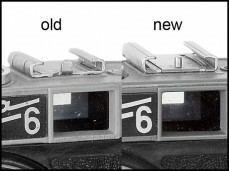 Changed aperture numbers from f/4 to f/16. 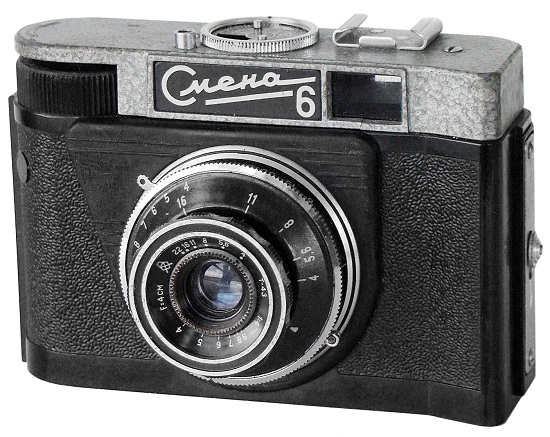 "SDELANO B CCCP" markings on the shutter housing (see picture below). Camera #035171 from Juhani Halmeenmaki (Finland) collection. PK2455. 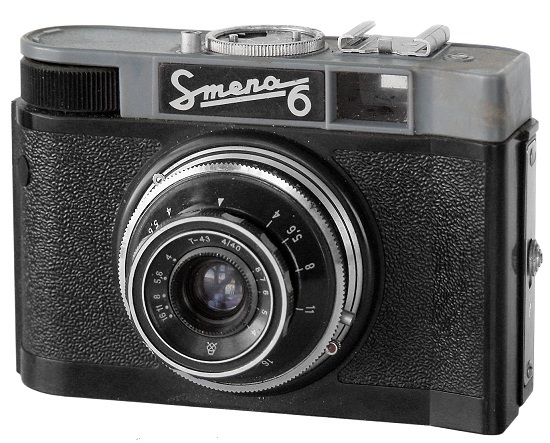 Seems to be an early type of regular Gomz logotype cameras. Though big majority of regular Smena-6 cameras have dark-gray top plate, this camera comes with white one yet. Decorative rims at the body margins already. Still bigger size serial number on shutter housing with "No." prefix (see picture below). Changed aperture numbers from f/4 to f/16 already, though late GOMZ cameras are known to exist with f/22 again (#105535, SovietCams). Tripod thread - 3/8''. PK2460. 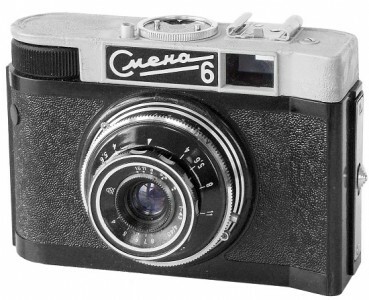 The first export type of the particular camera. Quite rare to find nowadays. 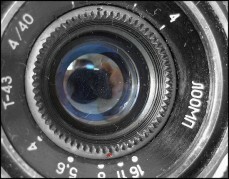 GOMZ logo on the lens frontplate. "SDELANO B CCCP" markings in Cyrillic characters on the shutter housing, below the serial number. Tripod thread - 3/8''. PK2465. Classic, but less common Smena-6 version with black body and light grey top plate. "SDELANO B CCCP" markings on the shutter housing. Tripod thread - 3/8''. PK2470. Very interesting sample of Smena-6 camera. 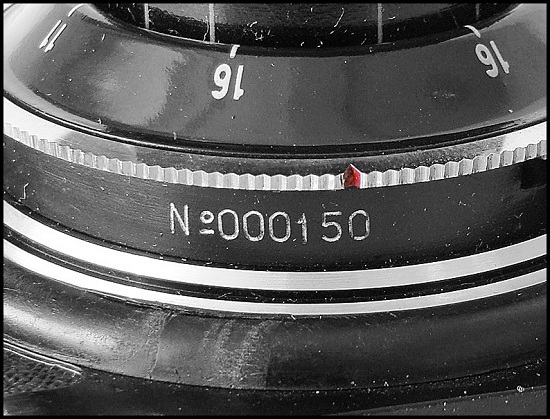 Still Gomz logo on the lens. Still old style of an accessory shoe. 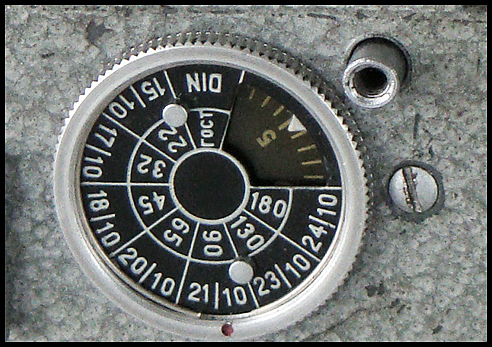 The only visual difference is camera's shutter outlined by wide decorative rim to strengthen camera's body (see picture below). PK2475. 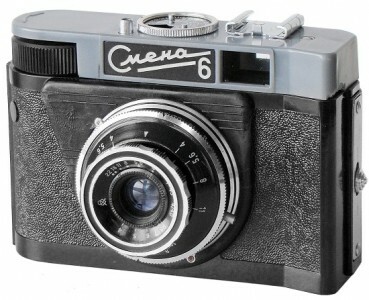 The most common classic Smena-6 model with black body and dark grey top plate. 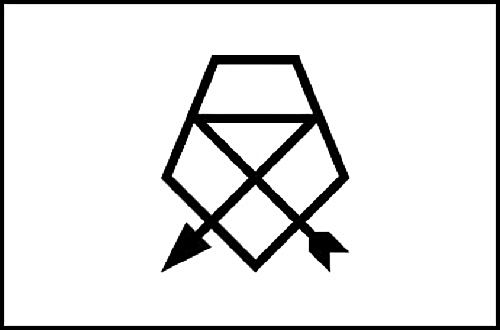 Slightly changed design of an accessory shoe (see picture below). Tripod thread - 3/8''. PK2480. Very uncommon version of Smena-6 camera. 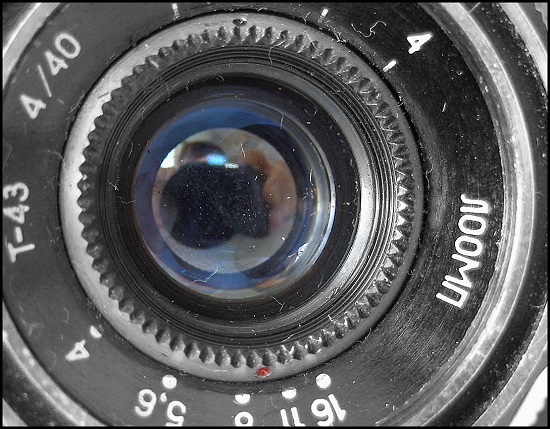 Rare LOOMP markings on the lens frontplate (see picture below). 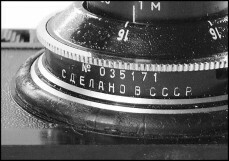 "SDELANO B CCCP" markings in Cyrillic characters on the shutter housing. Tripod thread - 3/8''. PK2482. 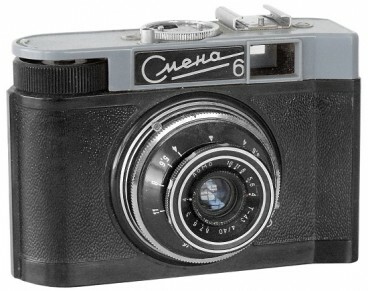 Camera identical to PK2480, but with export Smena-6 markings. Less common to find. PK2484. The one and only commemorative version of Smena-6 camera. "Great October-50" markings on the frontplate. Less common to find totally black body. The particular version comes with LOMO logotype already. Very thin nameplate markings. 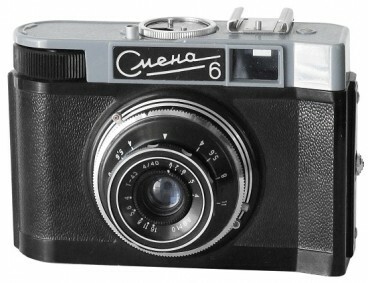 "Made in USSR" on the shutter housing. Tripod thread - 3/8''. PK2485. Camera identical to PK2484, but with regular gray top plate already. 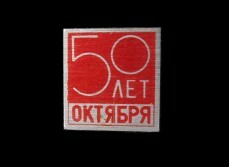 "Great October-50" markings on the frontplate. This camera comes with LOMO logotype already. 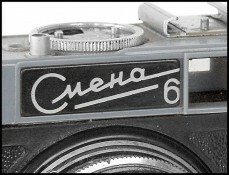 Very thin nameplate markings. 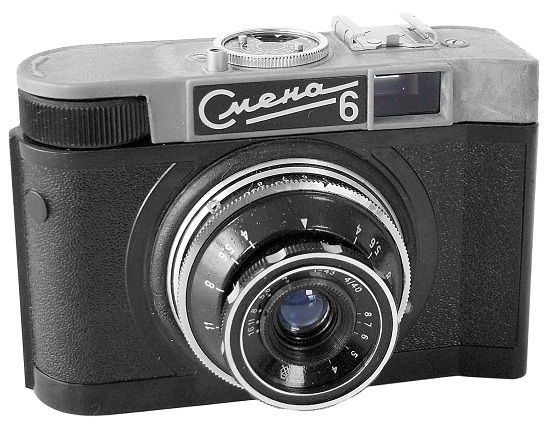 "Made in USSR" on the shutter housing. Tripod thread - 3/8''. PK2490. Camera identical to it's predecessors, but with LOMO logotype on the lens frontplate. Blank cyrcle on the rear door. "Made in USSR" markings on the shutter housing. Tripod thread - 3/8''. PK2495. Top plate has "metal like" imitation, with no decorative rim at the body margins. No otherwise different. PK2500. The third version of export Smena-6. 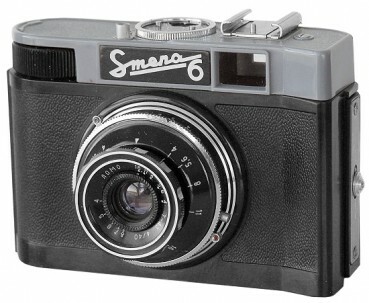 The only difference is LOMO logotype on the lens frontplate. 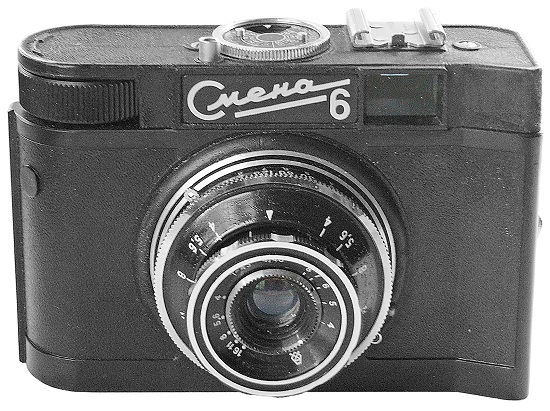 "Made in USSR" markings on the shutter housing. Tripod thread - 3/8''. PK2505. 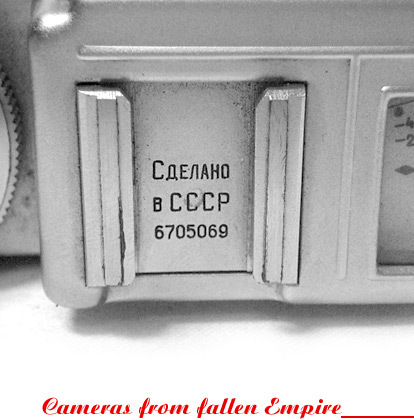 Seems to be late camera with very low serial number (see picture below). LOMO logotype, thin nameplate markings. Tripod thread - 1/4'' already. PK2510. The last version of particular camera. 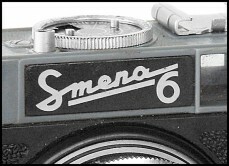 LOMO logo, thin nameplate markings. "Made in USSR" markings on the shutter housing. Tripod thread - 1/4'' already.